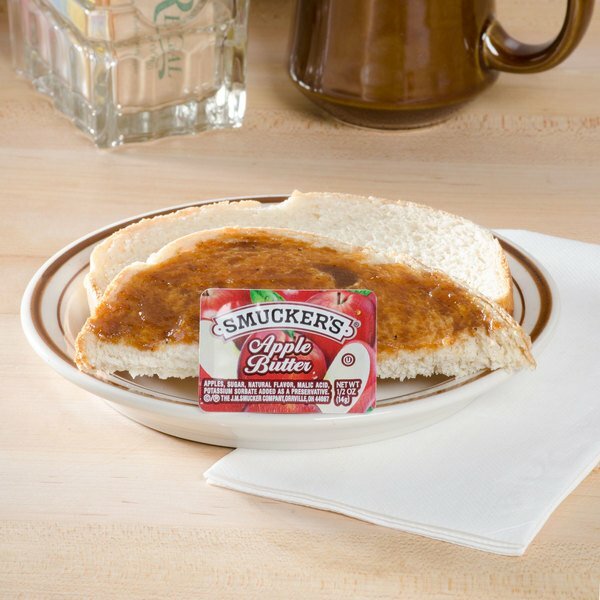 Now your patrons can experience the classic taste of apple butter on-the-go with the convenience of this Smucker's apple butter! 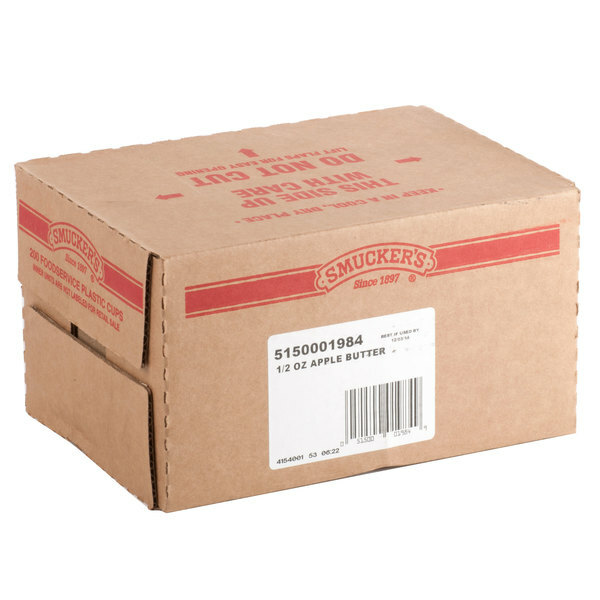 The name Smucker's is highly recognized in just about any venue, and their premium selection of spreads upholds a tradition of full-bodied flavor, great quality, and value. Apple butter brings a wholesome autumn flavor to your patrons' plates, and these handy plastic portion cups of apple butter bring the traditional Pennsylvania Dutch treat to your restaurant, diner, school cafeteria, or convenience store. Their .5 oz. size is perfectly-portioned for a single serving, and your customers can even grab them on the go with their take-out meals. Apple butter offers a quick and easy way to enhance menu items with the delectably sweet and subtly tart taste of wholesome fruit! It's the perfect complement to toast, biscuits, bagels, pancakes, and waffles. Rather than buying apple butter in bulk jars, these portion cups are easy to serve in caddies on your tabletop or hotel breakfast bar. Bursting with the orchard-fresh flavor of cooked apples, the smooth texture and butter-like consistency of this apple butter provides just the right amount of satisfying sweetness to your customers' dishes. Smooth, creamy apple butter always makes me think of autumn and apple orchards. But, this offering is great year-round. Anytime apple butter is on the table, guests know they're being treated right. And, the Smucker's name shows you really care. Great product. The best tasting apple butter ever made is right here. So creamy and lovely taste. Great on our scones and really nice set of spices add a great flavor to the butter. Love the great spices in this Smucker's apple butter spread. The butter is delicious on warm scones and the portion cups are the perfect amount. 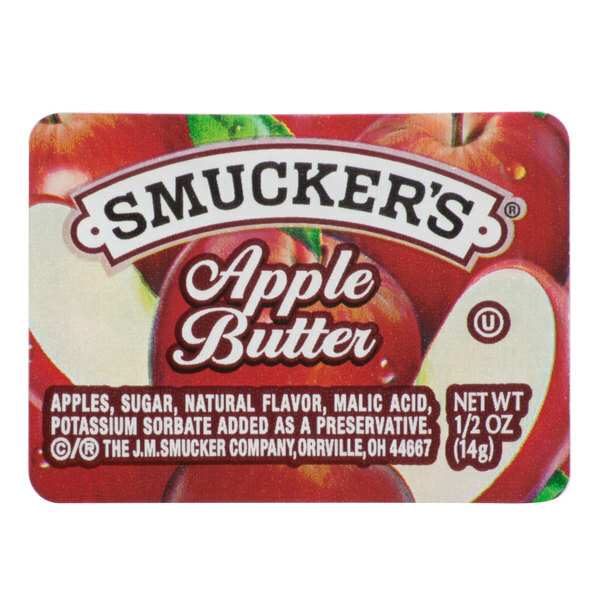 A great quality apple butter from Smucker's that really spreads well. The apple butter is a great nostalgic style spread that is perfect for our country buffet. Apple butter is a fan favorite at our breakfast cart. The smooth texture of the Smucker's brand is great. A nice fresh apple taste with great spices. The Smucker's apple butter is great. It is so creamy and has a wonderful taste and texture. It is a great fall spread and goes well on English muffins. I offer this all year round to my customers and it disappears rather quickly. It has a good consistency and it spreads evenly. Taste wise, my customers prefer the taste of this brand compared to others. Great jam that is more popular in the fall with apple spiced and pumpkin spiced flavored pancakes and things. Great flavor, easy to open, no issues. Yum again from a Smucker's product. Apple Butter has the flavor of apples but not the jelled part of the jelly. It's spreadable and tasty too. 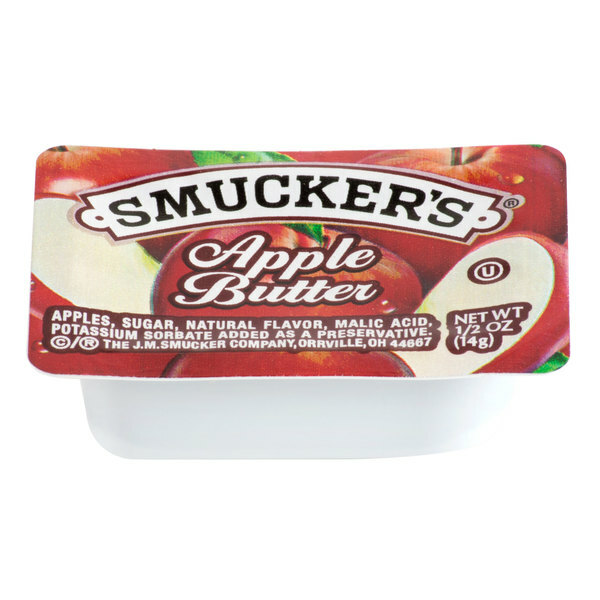 You want some good apple butter Smucker's is where it's at, it'll keep your customers coming back for more and more. The little packs are convenient in every way. Nice sweet tasting smucker's. A wonderful addition to our morning buffet line. Costumers like great tasting products like this, its what keeps them coming back.